School in northern India opens in July after the long summer vacation. The children are usually full of enthusiasm and energy – it reminds me of my childhood days. July is always a special month, friends sharing stories of their summer vacation, the smell of new books and the monsoon fun. I could see the same joy in seven year old Nidhi’s eyes. She was waiting for the school van eagerly with her lunch box and a new water bottle. Three years ago, when Nidhi joined our family, I couldn’t imagine that she would do so well. I felt proud when she was selected as the “Shining Star” of her class. 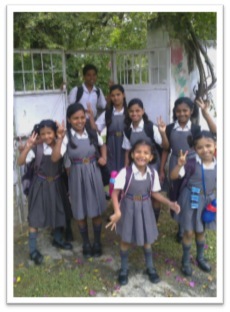 She studies in City Montessori School which is one of the better schools of Lucknow. Nidhi’s parents divorced when she was only two years old. She lived on the streets with her father who was an AIDS patient. And then, when Nidhi was three, her father died and she joined our family. 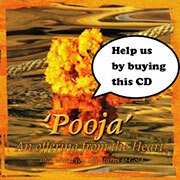 There has been no looking back since she came to Apna Ghar. At first it was difficult for her to adjust to living in our home. As days passed by, her confidence grew many fold, and then she had to adjust to attending a school like City Montessori. We will always be grateful for your support to shape the future of a girl child – girls are the most vulnerable children on the streets in India. Thank you for supporting our children in our Delhi, Lucknow and Gorakhpur homes. Thank you for moulding the future of many children like Nidhi. We are pleased to present the half-yearly report for the year 2015-2016. Read it HERE. Click if you feel called to DONATE, or SPONSOR a child. We are pleased to invite you as resource person in a State Consultation – Necessity of after care services to the individuals who had been in institutional care and have completed 18 years of age , hosted by STOP and supported by iPartner India on 31st of March 2018 at Lecture Room II India International Centre, New Delhi. The National Summit aims to bring together different child care institutions and other key stakeholders across Delhi to discuss the multifarious strategies being adopted for after care services. The summit will also seek the participation of survivors to provide feedback on the existing after care models and help the agencies understand the survivor’s perspective to Aftercare. We hereby request your participation as a resource person to the workshop. In case of any queries, please feel free to write to us at stopglobalmovement@gmail.com or call us on +91 11 6557 8290. A line of confirmation is highly appreciated.